If you haven’t visited our destination showcase, now is a great time to do so. We recently installed a 384 square foot (8 x 48) cascading wall fountain and a 672 square foot (14 x 48) relief carving. This article will focus on the wall fountain. This unique cascading wall fountain features rock face Serengeti Gold quartzite veneer of varying sizes and thickness which mimics the look of a natural cliff face. It also features stainless steel apron at the top and granite at the bottom. The granite catch basin is very near to the wall in order to make it appear as flush as possible, yet far enough out to catch splashing water. The variation in size and shape of the tile makes for a unique spill way for the water to cascade down the rock face as it weaves down the wall and is more similar to a natural water fall. You’ll be sure to enjoy he soothing sound of the water flowing down and the reflections it creates in the sun. 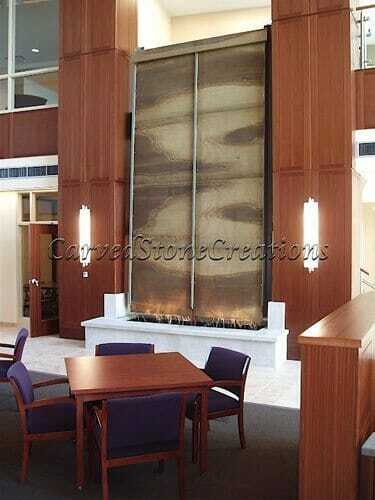 We can also create a cascading wall fountain like this in a smaller scale for indoor environments. This beautiful staircase in the lobby of an office building features cascading water fountains in the corners of the staircase base. The sandstone cascading wall fountains are s a nice contrast to the polished granite and they empty into a small pool beneath them. 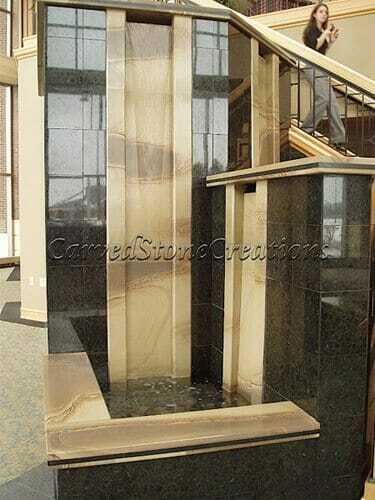 This larger sandstone cascading wall fountain is a beautiful contrast to the woodwork and limestone tile surrounding it in the lobby of a hospital clinic. The sound of the gently falling water creates an inviting atmosphere to gather in. We can also combine cascading wall fountains with some simple but effective lighting built into the top and bottom aprons of the fountain to make for a really stunning display as the water catches the light. If you want a cascading wall fountain similar to these, ask us about our custom design services or get a design quote. 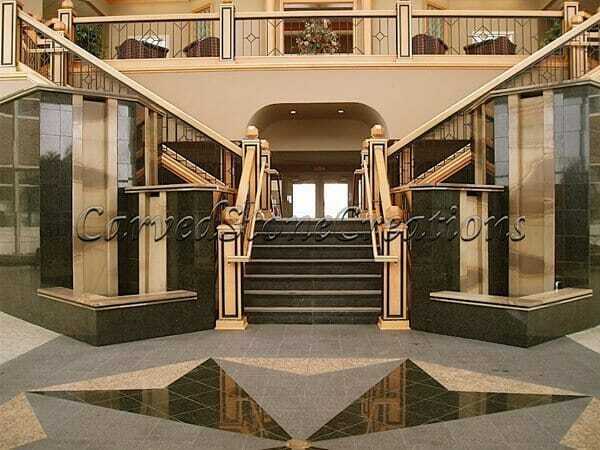 Carved Stone Creations is located in Kaukauna, WI and we are a reasonable drive away from many Midwest States including Illinois, Indiana, Minnesota, Michigan, Ohio, Iowa, Missouri, Nebraska, and the Dakotas. Visit our showroom to see first hand what we can design for you. Our convenient centralized location also means we can bring all of the tools and heavy equipment we need to tackle any installation job. We understand the affect our harsh Midwest winters can have on exterior stone work and we design and install architectural stonework like fountains, statues, exterior stone veneer, etc with those factors in mind. Well make sure the stone work we install for you stands up to the weather and the test of time! Outside of the Midwest? We can install there too. We have done work from New York to Florida to California as well.